Physicists at Harvard have built a radio receiver out of building blocks the size of two atoms. 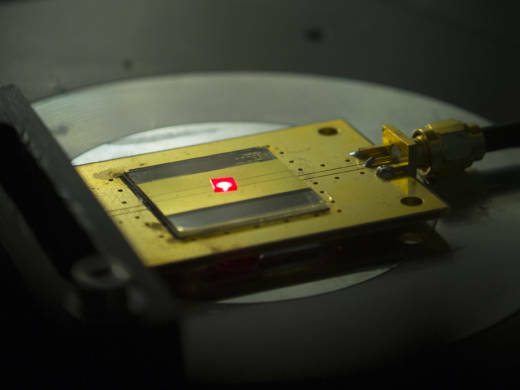 It is, almost certainly, the tiniest radio receiver in the world. Electrical engineering professor Marko Loncar and graduate student Linbo Shao applied basic radio engineering principles to a very small-scale machine. "Radios have five basic components: a power source, a receiver, a transducer to convert the high-frequency electromagnetic signal in the air to a low-frequency current, a tuner, and a speaker or headphones to convert the current to sound." With those five components as a starting point, let's consider the inner workings of the tiny radio, where there is a diamond crystal made of carbon atoms. The researchers replace some of those carbon atoms with nitrogen atoms, and leave a hole next to each one. That nitrogen atom/hole pair, called a nitrogen-vacancy center, basically creates the first two parts of the radio: the power source and the receiver. A green laser pointed at the nitrogen-vacancy center excites the electrons in the diamond. That's the power. When a radio wave hits those excited electrons around the nitrogen-vacancy center, it's converted into red light. That's the receiver. It's also one of the reasons nitrogen-vacancy centers are so compelling as a building block for tiny machines — they are natural light emitters. An electromagnet near the receiver can change the frequency to which the receiver is sensitive. That's the tuner. But at that point, your "radio" is just a glowing red light. It still hasn't made any sounds. For the last step, a common device called a photodiode converts the red light back to an electrical current, and a speaker or pair of headphones grabs that current and broadcasts it as sound. And voila: Christmas music, if that's what you choose to play through your tiny radio. The team published its work in the journal Physical Review Applied. Loncar and Shao are not the first to use nitrogen-vacancy centers for small-scale engineering. Other research groups are working on harnessing the natural light-emitting ability of the diamond imperfections to create quantum computers. One benefit of a radio so small you can barely see it is that the machine works at extreme temperatures. The Harvard team tested its radio at up to 662 degrees Fahrenheit. "Diamonds have these unique properties," Loncar said in a Harvard announcement of the findings. "This radio would be able to operate in space, in harsh environments and even the human body, as diamonds are biocompatible."